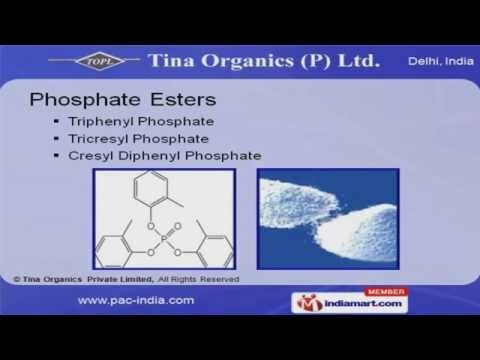 Welcome to Tina Organics Private Limited, Manufacturer and Exporter of Phosphate Esters, Performance Chemicals, Performance and Health Safety Chemicals. We are an ISO 9001:2000 certified company, incorporated in Delhi. Specialized R and D wing and Rigorous quality inspection help us to achieve a present repute in the market. Accurate composition, Timely delivery schedule and expert manpower are the plus points of our organization. We offer a vast range of PVC Compounding, Lube Oils and Engineering Plastics. Phosphate Esters, Performance and Health Safety Chemicals offered by us are one of the best in the market. We bring forth a wide range of Phosphate Esters that are available at market leading prices. We are engaged in offering supreme quality Triaryl and Tri Octyl Phosphate. Our Performance Chemicals are well known for their outstanding performance. Health Safety Chemicals offered by us are setting a benchmark in the market.